Wheeler touts successes but won't commit. Will make decision with family in coming year. 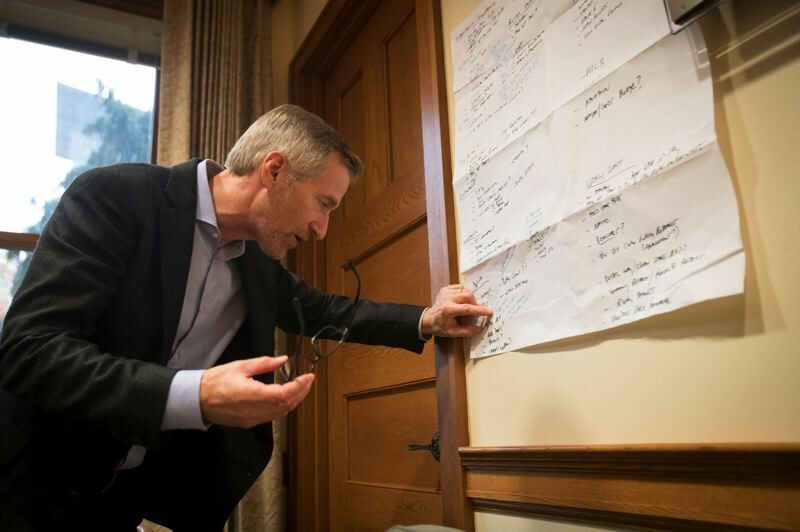 Mayor Ted Wheeler now says he expects to run for re-election despite a comment last month that indicated the opposite was true. His new comments came as political circles continue to buzz about what Wheeler muttered in the presence of a reporter for The Oregonian — that he "can't wait" for his term as mayor to end in two years. Though Wheeler has since dismissed the comment as stemming from momentary frustration, it has triggered continued speculation. What does this mean for Wheeler's agenda and the city of Portland? Who may line up to replace him? Walking back his earlier statement, Wheeler now says that while he hasn't made a final decision, people should assume that he's running again. And he is touting accomplishments and projects — a scrawled list of them is posted on the wall of his office — that he says he wants to see through. His way forward, however, is far murkier than it was a month ago. The muttering came on the heels of a botched proposal to regulate protests in Portland to address recurring assaults and fighting — a failure Wheeler made worse with comments blaming the media and others, but not himself. The public finger-pointing highlighted criticisms of his leadership style as well as authorities' failure to prosecute those involved in the violence at protests. 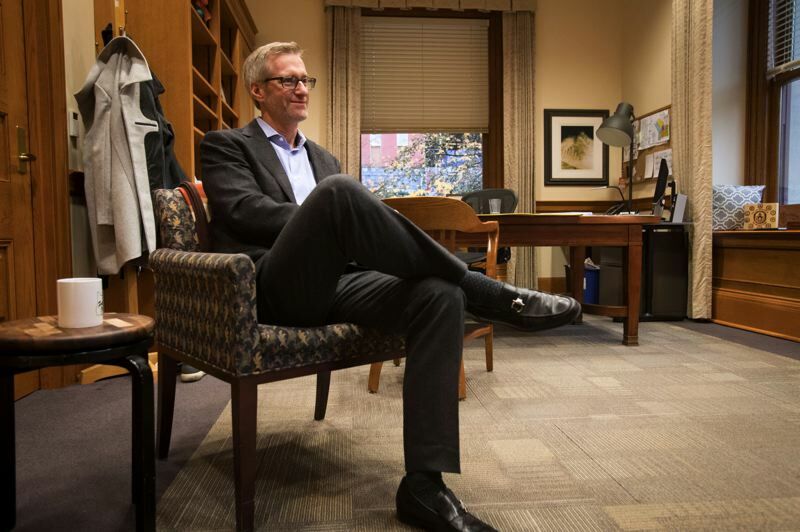 In a half-hour interview at his office last week, Wheeler addressed some of the criticisms, as well as Portland's unusual weak-mayor form of government, in which each member of the council oversees a portion of the city's bureaucracy. Tribune: Are you going to run for re-election? Wheeler: First of all, let me just address the (comment)... I was in front of an audience of 400 people speaking on the intersection of health and homelessness. I should not have let (heckling) get under my skin, but I did. I'll make a decision sometime in the next year with my wife about whether or not I'm running for re-election. But people should assume that I'm going to run a very aggressive re-election campaign, with an equally aggressive forward-looking agenda. That's my expectation. When you look at my agenda, there's a lot of work that we've put into what's coming to fruition now and will come to fruition in the next couple of years. We are very aggressively looking at a forward-looking agenda for the future, and I want to be here to see it through. But my family has a right to be in on that final decision, and I'll be making that decision sometime in 2019. Tribune: Do you see systemic issues with Portland's system of government that might have contributed to the string of mayors who only served one term? Wheeler: I knew what I was getting into. I knew it would be a tough job. Because of the form of government, every time you push a significant agenda item in front of the council, you have to effectively build a coalition government. So you have to work with bureaus that aren't necessarily under your control, you have to work with commissioners who have their own agendas. You have to bring the public along and that's a critical piece, particularly here in Portland, where people highly value public engagement in decision-making. But I don't view it as a problem, it's just the reality of the system that we have. Now, I have made some changes since I've gotten here. I've hired a chief administrative officer, tasked with the responsibility of centralizing as many management functions as possible. We've made great headway on the budgeting process. We've made some decisions as a council, for example the Build Portland initiative: We've committed to a 20-year initiative to invest in basic infrastructure like roads, parks and civic infrastructure. We're centralizing customer service, we've centralized the budget process. I've brought together bureaus to help reform our permitting process and speed up the process of getting affordable housing and other critical projects online. And we've centralized a lot of the livability issues, everything from trash collection to graffiti abatement. And so I'll keep looking for those opportunities, to keep looking enterprise-wide while respecting the reality that we're in a commission form of government. Tribune: Knowing how City Hall works, losing the protest safety ordinance vote did not come as surprise to you. Why did you press forward with that when you knew it would fail? Wheeler: I and Chief (Danielle) Outlaw approached that protest safety ordinance with a sense of urgency and with a sense of passion. We were very concerned, and we're still very concerned, with the increased frequency of demonstrations that devolve into violence. It became a national issue, and it was starting to be attached to Portland as part of our brand, as part of our image. We were concerned about the safety of the public, we were concerned about the safety of demonstrators. My colleagues, while concerned about these issues, and I think appreciating the intentions behind my ordinance, needed more time. And I thought I could get to three (votes), to be honest with you. But as my colleagues voted against it, they said they needed more time, they wanted more time to reflect on it, they wanted more time to meet with the ACLU and other organizations who'd raised concerns about constitutionality. And in retrospect I pushed them too hard, too quickly. I heard what they said as they cast their no votes, that in the future they want more time, they want to have more engagement opportunities. There's nobody to blame for that but myself. And I've learned the lessons from that. Tribune: It seems like you've been making unforced errors. Wheeler: Anybody who comes into this office and doesn't make errors isn't trying very hard. If you look at the issues on the wall, there are a lot of very high bars that I've set for my administration, and we are making good progress. Previous administrations struggled to find money, to find funding for transportation; I've found $600 million over 20 years through a new program called Build Portland. There's been a lot of talk about so-called community service officers, nonsworn officers who can help with public safety-related issues in the community. We'll be bringing that to the council shortly. The budget process in this city has been criticized as lacking in transparency, lacking in accountability, and lacking in financial discipline. We now have had two unanimous budgets. We just had a fall (adjustment) that brought a heightened level of discipline to the process. The housing bond has been an unmitigated success. And the list goes on and on and on. I didn't come here to play small ball. I didn't come here to sit in that chair and keep it warm. I came here to move my agenda in the community, to lift the city of Portland and the people who live here. And I will continue to be aggressive in my agenda, and that means we'll have spectacular successes, and we'll have spectacular failures, and everything in between. Tribune: What letter grade would you assign your job performance so far? Wheeler: Incomplete. I'm not even two years into this job. In less than two years we've moved to 100 percent renewable as a commitment. We just passed the straws and plastic ordinance on to its final reading where it will pass presumably unanimously next week. The website's going live in the next several weeks, 3-1-1 is going to happen. We've moved the auditor into a more independent position. The Portland Building (renovation) is on time, on budget. We've reformed the permitting process, we continue to work on that to speed up housing. We've set up the rental services offices, which was a major commitment of my campaign. A whole host of development projects are under way. These are all opportunities to shape the look and the feel and the future of this community. There's been a whole host of things around transportation. We increased the number of park rangers, we put more police patrols out there. We improved the analyst function in the police bureau to keep it accountable. Tribune: What would be your biggest criticism of your tenure? Wheeler: Much of the job of mayor and much of the work we do in this office is responding to the crisis of the moment — and not a day goes by where there isn't some crisis of the moment. But you can never lose sight of your agenda, and where you want to go and where you want the city to go. And I think it's taken us a while to get the right formula internally in terms of how do we deploy our very limited resources in this office to manage the crises du jour, and continue to move the agenda forward. I think we can do better in terms of keeping our priorities in line and following our north star relentlessly. Tribune: Do you need to adapt your style to the new City Council you're going to be dealing with, and if so how? Wheeler: I've worked with Commissioner-elect (Jo Ann) Hardesty going all the way back to when I was at the county chair. And we will undoubtedly have disagreements on specific issues, as I do with all my colleagues, but I believe I can work well with her. We've got an agenda that we need to work on together around public safety. She'll have the bureau of emergency communications and the bureau of emergency management.There's a lot of work that needs to be done to improve our response time to 911 calls. The office of emergency management needs to be more engaged with communities that are typically not directly engaged, communities where people speak a different language, people that come from a culture where they don't necessarily trust government to be the ones to help them in a time of need or a time of crisis, and I think Jo Ann will be uniquely well-positioned to partner with me on that. Tribune: Some people think a lack of humility on your part works against you. Do you think that is a fair criticism? Wheeler: At times it's a fair criticism. All of us could learn to be more humble; I certainly could. I've learned new types of humility on this job that I didn't even know exist. It's a very humbling experience being the mayor of Portland, and at any given moment there are always people there to remind you that you are human and that you have foibles, and that you can screw up just like everybody else. I believe that I'm a humble person. I approach this job with humility. I think you need humility to be able to survive and thrive in the position of mayor. But I also have confidence. I have confidence in my agenda, I have confidence in my team, and I have confidence in myself. If I didn't, I wouldn't have gone for the job in the first place. But I don't want to approach it with hubris. I've been a statewide elected officer, I've been county chair. Neither of those jobs prepared me to be the mayor of Portland, Oregon. You learn on the job. I hope that people will see that I'm very passionate about this community, that I care deeply about the people that I serve, that I am 100 percent committed to the agenda that I promised I would deliver when I ran for this office. And I hope they see my passion and my sense of urgency to address this agenda as that, as opposed to just flat-out hubris. Tribune: When you now say you expect to run again, people will think you've realized that your ability to achieve any success rests on people not thinking you're a lame duck and a short-timer. Wheeler: It was a stupid thing to say. That was out of frustration rather than a statement of fact. People should expect that I will run for re-election. My team knows that I am committed. I have explained it all to them. I am raising funds for a re-election campaign, including since that day. And people have a long history of underestimating me. If they think I'm just going to walk away, or if they think I'm not going to aggressively run for re-election should my wife and I decide to do that a year from now, they will be sorely mistaken.